For ages 3 and up! Handcrafted of RealTouch® vinyl with hand-painted features. Weighted and poseable. Arrives with cloth diaper, pink sleeper. A little girl and her beloved baby doll - what could be sweeter? Now, The Ashton-Drake Galleries is excited to present the most lifelike play doll in the world: the So Truly Mine® Baby Doll, specially created for kids ages 3 and up. Perfectly sized at 15-inches long, the So Truly Mine® Baby Doll: Dark Brown Hair, Brown Eyes, Light Skin by Master Doll Artist Linda Murray is designed with many of the same features as our high-end collectible dolls, with a size and construction ideal for little girls. 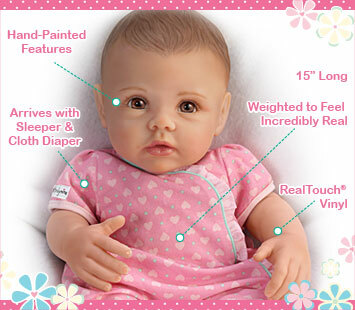 Poseable and weighted to feel so incredibly real nestled in your little girl's arms, this realistic toy baby doll is handcrafted of soft RealTouch® vinyl and arrives ready for snuggling in a soft pink sleeper trimmed with ribbon ruffle land a cloth diaper. From her sculpted dark brown hair and eyebrows to the soft blushing of her chubby cheeks, the features of this exquisite So Truly Mine® baby girl doll are masterfully hand-painted to enhance her precious beauty. Strong demand is anticipated, so hurry. Order now!